This week's TGIM is all about becoming who you're meant to be though actions : Getting out of your comfort zone and doing things better, working harder, stop being average. It's easy to be average. It's hard to get to Good and then Great. I can only imagine how much harder it is to become Phenomenal. I bet that the rewards are probably proportional to the effort you put in : Action Reaction. I think everyone starts at Average and some decide to take the next step and become Good, Great and Phenomenal. 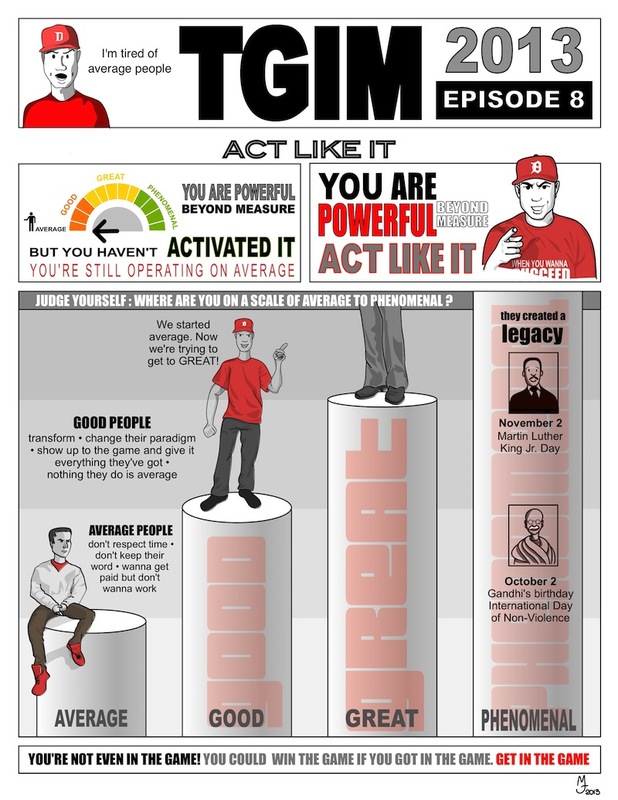 One a scale of Average to Phenomenal, where do you think you are? I think I'm at the end of average and the beginning of good. I started a couple things, but there's a lot more to do. Working on this sketchnote brought new projects ideas for me to start at some point (hopefully this year). I wanna see how far I can take this as well.